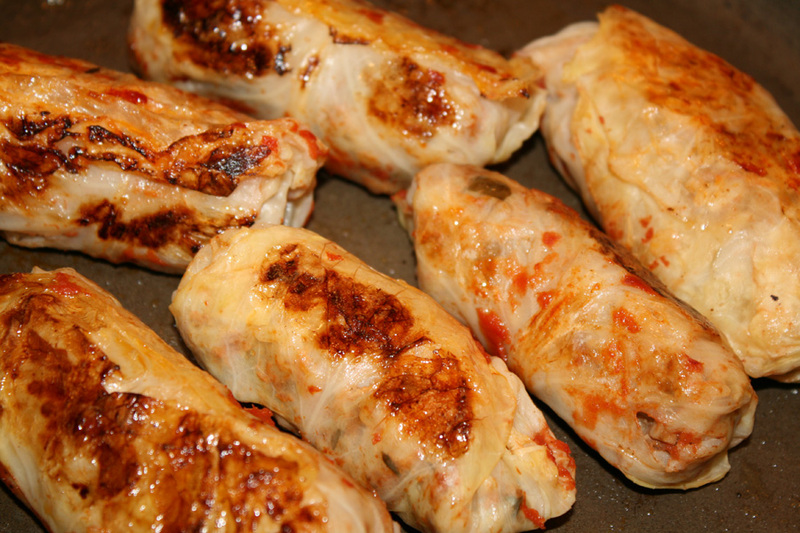 13 Comments on "Browned Cabbage Rolls"
Tryed the cabbage roll.very good.i add small pieces of bacon in the mix.l roll very tight.and like small cabbages.which gives you small leafs.you bet your dewpa. I’ve bought the makings for the cabbage rolls today and plan on making them tomorrow. My question is once they are cooked, you mentioned they are better the next day, so I wait until then to enjoy? Also, about freezing them, do I do that before browning them in the frypan the next day? I was so happy to run across your youtube about them as it’s been years since I enjoyed them. My mom used to make them & they bring back happy times to me. Thank you. I hope they turn out as good as hers! There is no need to hold them for the next day – just let them rest for about 15-20 minutes before serving. I always freeze mine after they are cooled but I do not brown them before freezing. Should I precook the rice if I use brown rice? I made it with brown rice, uncooked. So then you tried both the converted rice and the brown rice, but your preference is the converted rice? If so why? Also, what do you serve with the cabbage rolls? Jenny, what a surprise to run across your YouTube videos! A very pleasant surprise! Years ago, when you were on tv, my husband and I faithfully watched and enjoyed every episode. My husband became quite enthralled with you and when you were in Dallas I surprised him and we attended one of your shows. You were open and friendly and as we shook your hand, I realized my husband was quite speechless and awestruck! And this from a salesman who could talk and sell to anyone! You moved on to greet others and I couldn’t hold back my laughter and teased my husband many times about him freezing and being unable to speak to you! He passed away last year and, oh my goodness, how he would have enjoyed watching your videos not to mention trying all your recipes! You’ve brought back wonderful memories and oh yes, your food is delicious and love your recipes and videos! Keep ‘em coming!! I have not made this yet, but for sure, i will do it soon! Thank you for the wonderful recipe Jenny. Have not made your cabbage rolls yet, but i am going to soon!! Thank you for the wonderful recipe. The best thing I’ve ever had!!! Strongly recommend !! It’s always a go to for dinner everyone loves it! I think all your food look delicious. I am surely going to try your Cabbage rolls. I think they look delicious and edible. I am from the West Indies, a small island in the Caribbean Sea. Its a beautiful island. I don’t mind cooking at times. O.K. Love watching you cook. I want to taste everything. Thank you so much and much love. Always, again thank you!!! Wow, they look just like his! But looks can be deceiving. I’m going to have to get down there and check it out. I used to make mine with ground moose, when I lived with the meese.